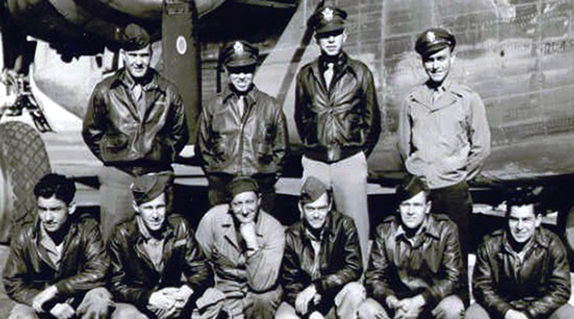 The Lewis Crew was one of the original crews for the 492nd BG that trained in Alamogordo, New Mexico. They transferred in as crew 1653 from the CCTS (Combat Crew Training School) in Biggs, Texas, on 3 Mar 44. They were assigned to the 858th BS, designated as Crew 813. While training at Alamogordo, Sgt Bullock suffered a perforated eardrum, thusgrounded from air duties. It's unknown where Bullock went but records show he was no longer with the 492nd. This happened just before the Group's departure to England. Bullock's position was never replaced. The crew flew their missions without a ball turret gunner. Capt James Lewis signed out for a B-24J, 44-40133. According to Howard Heckmann, they named their plane, UNINVITED. In April 1944, they flew their assigned aircraft to North Pickenham, England, via the southern route. Their ground Crew Chief S/Sgt Riolo flew with them taking Bullock's vacant spot. By our count, Capt Lewis flew as the aircraft commander for Crew 807 for a total of 2 missions. This is consistent with Howard Heckmann's memory. Shortly after arriving to North Pickenham the crew swapped navigators with the McMurray Crew 801. Theory is that since Lt Hedges and Capt Lewis were both from the same neighborhood in Cheyenne, Wyoming, they wanted to fly together. We are still trying to confirm when the switch was made and if Lt Farrell flew his first mission with Lewis or McMurray. On 19 May 44, Capt Lewis flew as the lead ship of the B section (high right) on a bombing run over Brunswick, Germany. Also flying with the crew was Lt Rogers (858th Squadron Operations Officer) and Lt Lutonsky as a Pilotage Navigator. By then Lt Farrell had already changed crews with Lt Hedges from the McMurray Crew 801. Records show he was on a four day pass along with the officers of the Landry Crew 817, Miller Crew 810 and McMurray Crew 801. The J A Hey Casualty Report says the Lewis Crew was the fourth plane downed by a pass of about forty FW-190s. The Crew's gunners said they saw the planes on each side of them get hit before they got nailed. Only three gunners were able to bail out and survive. 8 KIA, 3 POW, MACR 5245. The plane crashed within the city of Hannover on Spannhagen Street. The Germans buried the bodies at the local cemetery. After the war, all but two were brought back home. Howard Heckmann, waist gunner, says he vividly recalls the planes on each of his wings getting hit first. "Then we got riddled with 20mm cannon fire," he said. "I don't think anyone in the front was still alive," He pointed out that the bombs were still in the racks. If anyone up front was still alive he would have salvoed them. "I could see the top turret gunner (Contioso) lying dead on the catwalk. It was obvious no one was flying the plane and we had to get out." There were only three men in the back. Tail gunner Warren Rudolph had been wounded in his back and one arm. Howard and the other waist gunner, Joe Ciullo, helped Warren get his chute on and pushed him out of the plane. Then they jumped. All three landed near Mandelsloh. See: Mandelsloh Story, linked at right under Stories. There seems to be some question about Lt Ehrnman's fate. We found him listed in the NARA AAD POW file. It included a notation that said he died as a POW. No camp or other details were given. Since Lt Rogers was flying in the co-pilot's seat, no one can say exactly where Ehrnman was at the time of attack. This fits Heckmann's account that no one was flying the plane. Therefore, we suspect he did survive the initial attack but was severely wounded, jumped out and then died in a German hospital after he was found. German reports also state that the plane's serial number was clearly visible after it crashed in Hannover. One has to wonder if Lt Ehrman or someone else had salvoed the bombs somewhere between Mandelsloh and Hannover. Name seen spelled "Farrall" or John "F"
Page last modified Saturday, May 25, 2013.